A parliament is a legislature. The name is derived from the French parlement, the action of parler (to speak): a parlement is a talk, a discussion, hence a meeting (an assembly, a court) where people discuss matters. Below is the list of Parliament's name in some of the Famous countries of the world. Here we are providing the List of Parliaments Names in Different Countries. we have seen in most of the exams at least one question is asking from parliament names. 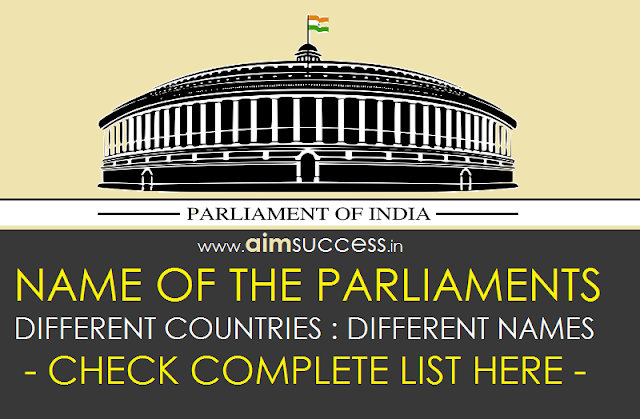 So we provide the complete List of Parliaments of Different Countries which will be helpful for your upcoming IB, SSC MTS, SSC CHSL, SSC CGL Tier II, UPSC, PSC Exams. You can download the complete list as free PDF from the link given below. Share your Suggestions and feedback in comment section.